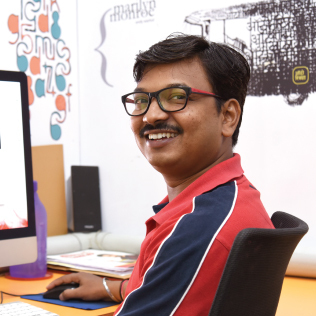 Lovingly known as Bhai and indeed the big bro of the gang, Mr. Nivalkar holds his expertise in healthcare creative. With great control over mind and hands, this design mate has made Threedot Designs proud on several occasions achieving timely milestones in design and beyond. Belonging to the cradles of Ratnagiri, Shashi is still a family man. Bhai has never stepped back in dedicating himself for the positive growth of the agency & his colleagues with quality and discipline. Mr. Nivalkar’s love for food and passion for music add to his self-specifics along with professionally possessing the qualities of decision making and enthusiastic approach towards various projects handed to him. This Mr. Short-Stature characterizes with tall virtues of patience, commitment and dedication.